Glen David Gold wrote a fictional book in 2002 about touring illusionist Charles Carter called "Carter Beats The Devil". It was an interesting book in that he took many true stories from the world of magic and weaved them into his book. It made quite the splash in the magic circles and an even bigger splash with the general public. So much so that Tom Cruise purchased the rights to make the book into a movie. This was very exciting for magicians as well, but then nothing happened. It appears now that the Carter Beats The Devil is back and getting a green light by Hollywood. Let's hope it makes it through this time. The talk in regards to the movie is that Johnny Depp is being looked at as the lead. It's a shame this wasn't made 25-30 years ago, as my vote would go to Charlton Heston, whose real name was John Charles Carter! As much as I enjoyed the Glen David Gold book, I must be fair and say that the OTHER Carter Book is far better from a historical point of view. That would be the Carter Book by Mike Caveney. When I first read this book I could hardly put it down. Before reading it the only thing I knew about Carter was that he had some really cool posters, like the one above, and the Carter on a Camel poster (see below) and the Vanishing Elephant poster. But his life story is so much more interesting than his posters. He was born Charles Joseph Carter in New Castle Pennsylvania on June 14, 1874. His ancestors had originally settled in Anne Arundel County Maryland and according to the Caveney book, founded the town of Cartersville. However, it appears that the town no longer exists as the only Cartersville I could find is in Georgia. In 1884 at the age of ten, young Charles Carter was already toying with show business. He presented his first public show in Baltimore with the clever billing "Master Charles Carter the Original Boy Magician". A few years later he pursued a career as a magician, but dropped the moniker "Original Boy Magician". He traveled all over the United States. In 1894, he met Corrine whom he married and made part of his show. One year later their first child Lawrence was born. 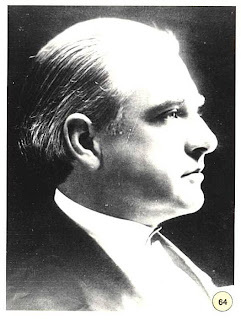 In 1900, Charles decided to settle down in Chicago and get off the road of touring. He instead opened a theatrical agency called The National Theatrical Exchange. He also started his own theatrical trade magazine called The Chicago Footlights. With is own magazine he was able to take jabs at other magic acts. One of those he appeared to dislike was The Great Lafayette. Apparently, Carter felt that Sigmund Neuberger was anything but 'great'. 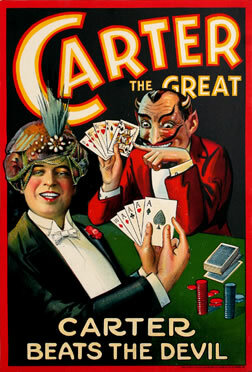 Though, after Lafayette died in a tragic theatre fire, Carter was quick to add a number of his tricks to his own show. By 1903, with his National Theatrical Exchange up and running, Carter and his wife Corrine started taking work again with their magic act. It was also around this time the Charles Joseph Carter enrolled in Law School. He graduated on May 31, 1905. In 1907, Charles Carter, then known as Carter the Mysterious, set sale with his wife and several tons of equipment for Australia. Carter hired Allan Shaw the coin manipulator to be in his show as well. This world tour would take him through, New Zealand, India, China, Sri Lanka, Egypt, Italy and more. The first world tour lasted until 1909. The second world tour would start six months later in 1909 and last until 1912. His first use of Carter the Great was on an advertising poster printed in 1905, but he mostly went by Carter the Mysterious. It appears that it was a number of years later that he dropped all the various monikers for the more simple and direct Carter the Great. You might wonder what kind of magic Carter presented on his tours. Well he carried a full illusion show which grew in size after each consecutive tour. His early tours included FLYTO, which was an illusion where two people would vanish and then exchange places inside two cabinets set some distance apart on the stage. He also used William Robinson's GONE Chair. This was a simple chair in attached to ropes. His wife would sit in the chair and it would be hoisted several feel in the air. Upon his command she would vanish in thin air and the chair would fall to the ground. He originally called this illusion "The Magical Divorce" which is really funny. But apparently his wife Corrine didn't get the joke and made him change the name of the illusion to "The Phantom Bride". An interesting historical note, at the end of his second world tour Carter tried to book passage upon a new ocean liner only to discover he was unable because a large contingent of wealthy passengers had taken up the bulk of the ships storage. That ship was the RMS Titanic. It was our good fortune that Carter was unable to get on this ship. Though imagine what a movie ending that would make! Besides Allan Shaw there was another celebrity of sorts in the Carter Show, PSYCHO the automaton. This was the mechanical figure that Harry Kellar had toured with for many years. Truth be known, PSYCHO was actually a copy of an automaton created by John Nevil Maskylene. When Howard Thurston purchased the show and it's properties from Harry Kellar, he sold several of the pieces. One of those was the PSYCHO automaton. In 1919, Harry Kellar actually purchased PSYCHO back from Carter and then proceeded to give him to none other than Harry Houdini. PSYCHO still survives today in the collection of John Gaughan. Over the years Carter added some of the greatest illusions ever made to his show. Among these was a duplicate of the Kellar Levitation, The Lion's Bride a creation of The Great Lafayette, The Sawing in Half Illusion, The Vanishing Elephant, The Torture Cell of Spikes, The Million Dollar Mystery and many others. In 1922, the archeologist Howard Carter discovered the lost tomb of King Tut. The news of this spread across the world. Interest in Egyptology was at an all time high. Charles Carter decided rather keenly to ride the wave of this phenomenon. Because their names were similar, Charles Carter commissioned a special 'Egyptian' poster. This was based on a photo that was taken of Carter sitting atop a camel in front of the Sphinx and the Pyramid of Cheops. It's a brilliant marketing move and no doubt helped Carter the Great increase his show attendance. 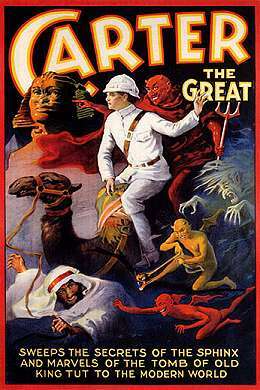 Another example of Carter taking advantage of the news headlines was when he added an illusion called "The Escape from Prison of the bandit Dillinger". John Dillinger was a famous outlaw bank robber from the 1930s. He became somewhat of a folk hero in America during the Great Depression. Dillinger was killed in front of the Biograph Theatre in Chicago in 1934. Carter took the cabinet from the "Witch, The Sailor and The Enchanted Monkey" routine and used it as a pseudo jail. This cabinet had bars on the front just like a jail cell so it worked perfectly. In the routine, Dillinger would vanish from the cell only to be replaced by two females, then he would appear elsewhere in the theatre. Carter the Great would eventually go on 7 world tours. The exploits that took place during those various tours are covered wonderfully in the Carter Book by Mike Caveney. The book is out of print, but you can find it from time to time on Ebay. It is well worth reading. Some of my favorite stories involve the Chinese Govt holding Carters props hostage, and Charles Carter being a jewel smuggler! Charles Joseph Carter suffered a heart attack on his way to Bombay India. He was sent to the hospital and his son Larry took over the show. Eventually, Charles Carter would have another heart attack, this time fatal and he died on February 13th, 1936 at the age of 61. He was embalmed and returned to the United States. Carter was buried in Calvary Cemetery in Queens NY. It was said that Carter had a pact with Houdini, just like the one Houdini had with Bess. The idea was that whoever died first would contact the other using a code. But as far as we know, no word has come from either showman. Another really good post - thanks. Got to love a lucky Titanic escape. During the Essential Magic Conference 2011, Mike Caveney showed a video of him performing Carter's Million Dollar Mystery at the Magic Castle. Mike owns the original prop. The routine was great and it's amazing to see Carter's props still in action!